Basina or Basine (c. 438 – 477) was a queen of Thuringia in the middle of the fifth century. She left her husband, king Bisinus and went to Roman Gaul. She herself took the initiative to ask for the hand of Childeric I, king of the Franks, and married him. For as she herself said, "I want to have the most powerful man in the world, even if I have to cross the ocean for him". This remark of hers may have been related to Childeric's successful invasion of the Roman Empire and his attempt to settle a Frankish kingdom on Roman soil. She is the mother of the man who is remembered as the founder of the Frankish realm and modern France. She and her husband Childeric named their son Chlodovech, but he is better remembered under his Latinized name, Clovis I. King Childeric's maternal grandparents were the same as Basina's paternal grandparents- they both shared their grandfather Clovis of Cologne of the Riparian Franks (399-448). Through the ages historians have been intrigued by the story of Basina since she obviously acted as a player and not as bystander — which is not uncommon for women of the German clans, but highly uncommon for the Romans. 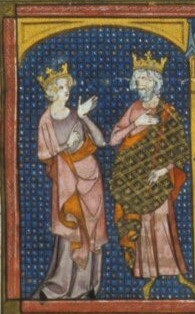 Clovis I (466 – 511). Queen Basina of Thuringia is the central antagonist in the 2005 film, The Brothers Grimm. ^ Gregory of Tours. "Book II". The History of the Franks. Translated by Lewis Thorpe. Baltimore: Penguin. ISBN 9780140442953. 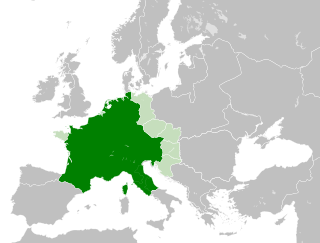 Wikimedia Commons has media related to Basine de Thuringe. 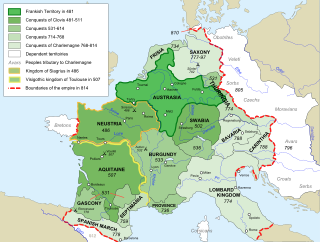 Aregund, Aregunda, Arnegund, Aregonda, or Arnegonda was a Frankish queen, the wife of Clotaire I, king of the Franks, and the mother of Chilperic I of Neustria. She was the sister of Ingund, one of Clotaire's other wives. Ingund and Aregund were the daughters of Baderic, King of Thuringia.